Gov. Dannel P. Malloy is given a tour of the Bigelow Tea headquarters in Fairfield on Monday by Cindi Bigelow, the company president. The Fairfield home-grown -- rather, home-brewed -- tea giant, Bigelow, got a visit from the state's chief executive this week. Gov. Dannel P. Malloy visited the Bigelow corporate headquarters and manufacturing facility on lower Black Rock Turnpike to see how the family-owned and -operated specialty tea company has evolved since it was founded 67 years ago by Ruth Campbell Bigelow. 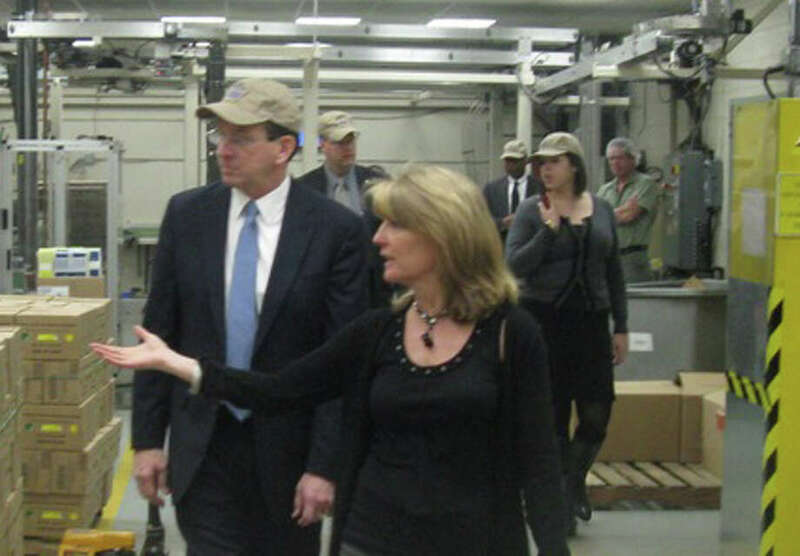 Malloy, accompanied by Cindi Bigelow, the company president and granddaughter of Ruth, accompanied Malloy on his hour-long tour of the 110,000-square-foot complex where he inspected the manufacturing process and greeted employees, according to a statement issued by Bigelow Tea. "It was wonderful to have the governor come to Bigelow Tea to tour our facility, get to know more about our family, our tea company and meet our employees," Cindi Bigelow said in the statement. "And it was a special treat to have him take time to learn more about our organization and some of our issues being a manufacturer in Connecticut. He quickly learned we love this state and are very committed to being here." From its founding in 1945 after Ruth Bigelow created the company's signature "Constant Comment" tea brand in her kitchen, Bigelow Tea has become the largest American producer of specialty teas, annually making 1.6 billion tea bags in more than 120 varieties. The business employs about 330 people, with 120 working at the Fairfield facility.